BE PATIENT - I would give Disney until Wednesday, April 25, to respond to E-Mails and by end of next week, April 27, to publish a "fix" before making any decisions. I had to move my secondary base from home tab to pc on bluestack,is a pain to play so only login every now and then. My main base on phone is barelly playble at 10/15 fps,had no issue before update. Just a quick update. I was able to determine the issue with running SWC using Andy was due to the Android version. Andy uses Android 4.2.2 (at least on my Mac), and SWC now requires Android 4.4. I found that Bluestacks now supports v2.0 on a Mac, so I downloaded and installed. I'm once again able to run SWC in an emulator on my Mac. For my Chromebook, the responses haven't been particularly helpful. Their advice so far is to run it on a different device. I'll keep working on the problem with them and hopefully there will be some sort of resolution in the future. Game room is downloading an update for me right now. Spock wrote: Android or iOS? Game room, whatever that is. On windows. One month ago, Disney has released an excellent update that worked on most of devices, even the ones very old, according to Developer Note in the game, and suddenly they released a massive update, more a new plataform (6.0) than just an update, and that is NOT working on most of the devices that the previous update worked? 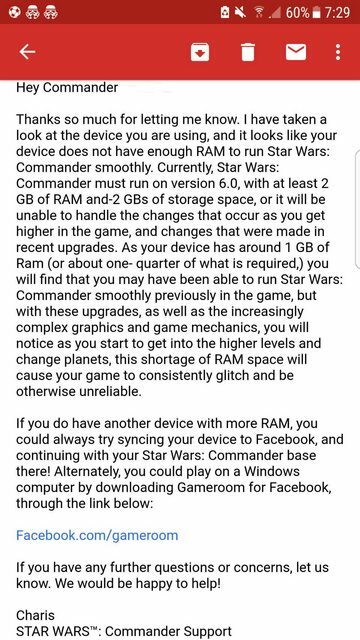 Hmmm... And now people from Support are advicing players that can't play with their old devices anymore to install FB Gameroom and go play on Windows? Should not the SWC be a mobile game? What is wrong with those guys? GTH, Disney. 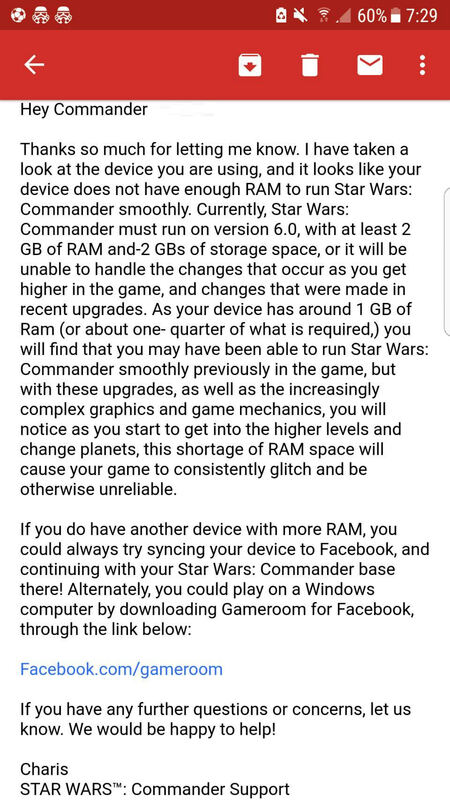 Well thanks Disney....I won't be playing now, because I am not willing to buy a new computer or upgrade this one, just to play your game. I do appreciate you making it easy for me to keep my wallet in my pants.